The classic Spanish/Moroccan/Sicilian combination of oranges and fennel contributes mightily to brightening up the monotone gray days of winter. No, it can't add blue skies and sunshine, but oranges add color and a bright citrusy flavor, while aromatic fennel provides texture and a mild licoricey note. Add some sweet, anise-flavored Pernod and oh my! there's something special happening here. 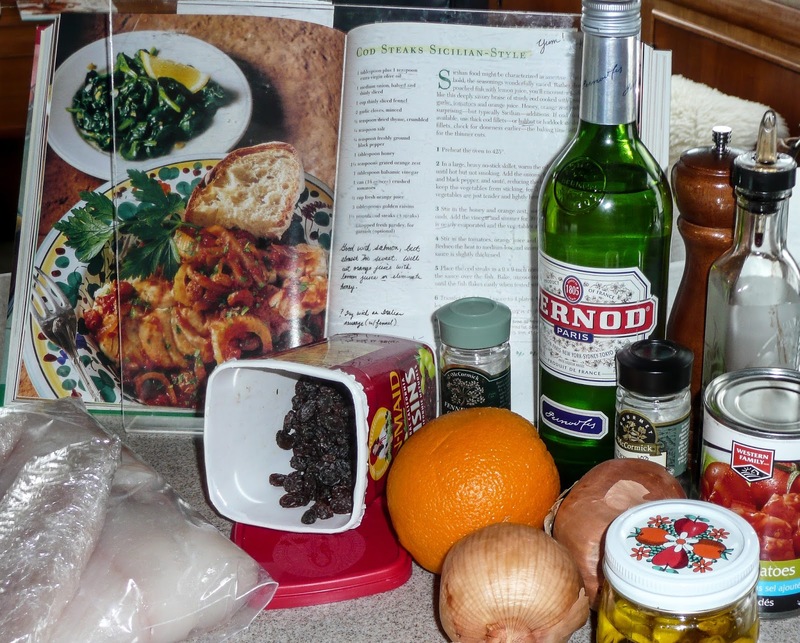 or occasionally afloat as a stovetop preparation for freshly-caught Halibut Sicilian Style. Then a colorful Pinterest photo brought me to a recipe for this chicken dish. Lucky me! it's a winner straight from the oven, then later in the week shredded in a rice bowl and finally diced in a stovetop hash. Spring seems ever so far over the horizon, some big page flips of the calendar away, but meanwhile this entree will brighten up Seattle's occasional gray wintery days. inspired by a Pinterest link from Foolproof Living, who adapted a recipe from Ottolenghi's Jerusalem. Mix Pernod, olive oil, orange juice, lemon juice, mustard, brown sugar, salt and pepper in a large ziplok bag. Dry the chicken thighs with paper towel. Place chicken thighs, fennel wedges, orange slices, thyme, and fennel seeds into the bag of marinade; toss to coat. Refrigerate and let it marinade at least for 2 hours or overnight. Pre-heat the oven to 475 F Degrees. Place the chicken thighs, presentation side up, in a single layer, into a large ovenproof glass pan. Arrange the fennel wedges and orange slices over and around the chicken thighs. Pour the marinade over all. Cook, uncovered, in the preheated 475 F oven until juices run clear, about 45 minutes. 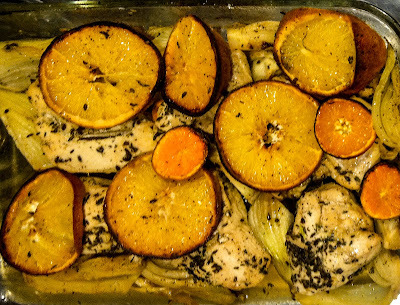 Use a slotted spoon and move the chicken thighs, fennel wedges, and orange slices onto a warmed serving plate. Cover and keep warm; set aside. Pour the juices into a small wide skillet or pan and bring to a boil over medium-high heat. Lower the heat and simmer until somewhat thickened and reduced to 1/2 cup. Place a serving of rice on each serving plate, top with chicken and drizzle some sauce over the top. 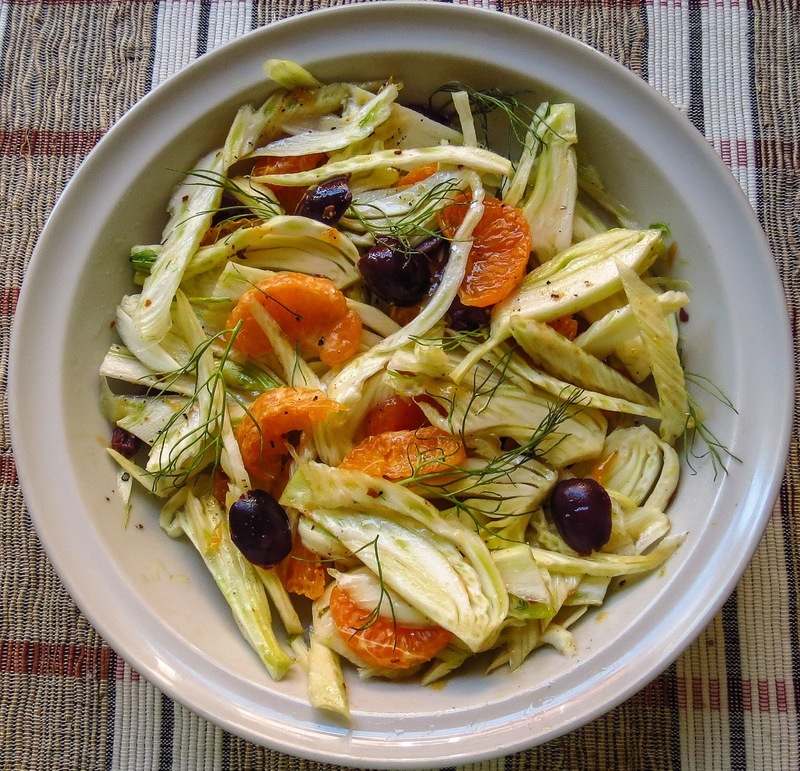 Garnish with fennel fronds and serve. 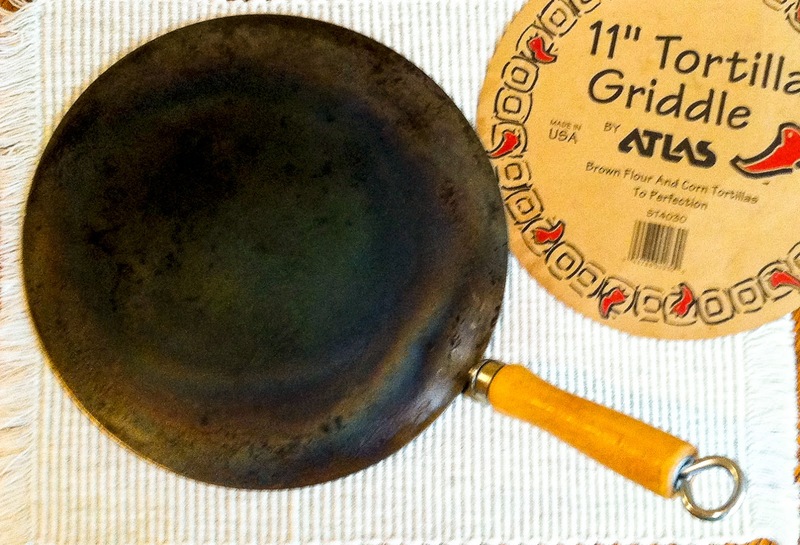 Or... serve on the warmed platter with a pitcher of sauce on the side. 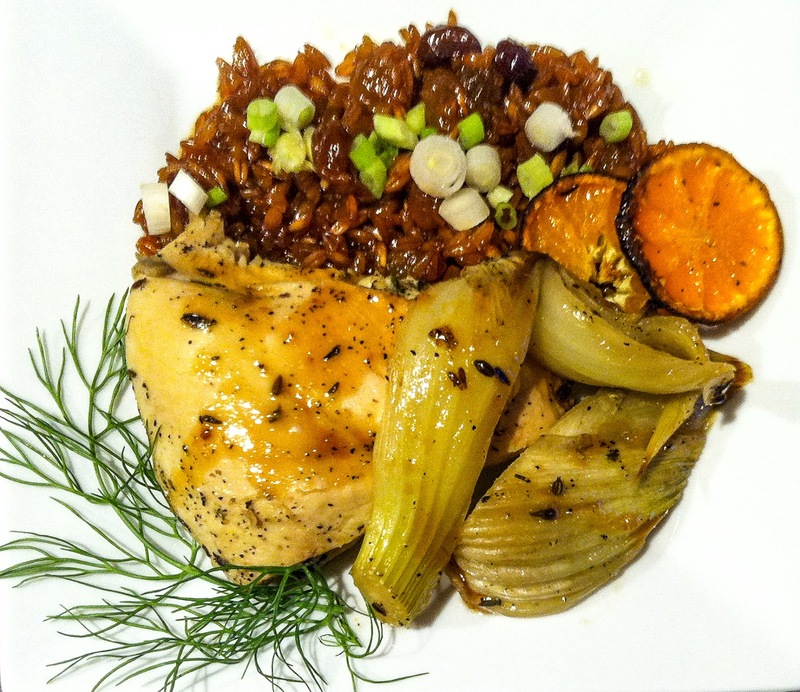 Wild rice pilaf makes a tasty accompaniment. Reputed to be the national dish of Brazil, possibly reflecting a Portuguese influence (link), feijoada is the perfect comfort-food antidote to a cold snowy day... or a chilly wet weekend... even a bracing sunny day. Simple enough to whip up for family meals, it might also please company at a soup and bread feast. Our first introduction to feijoada was ages ago, as guests at an open house feast hosted by friends who were home again following a multi-year posting in Brazil. Their feijoada presented various cuts of grilled pork and pork sausages piled alongside spicy, soupy beans, some greens and bowls of fluffy rice. Both the event and the meal were memorably delicious. A classic feijoada would include a variety of meat selections, typically pork; some smoked or cured, some fresh, some spicy and some mild. Dried beans would simmer on the stovetop for hours to soften, perhaps 1/4 of the cooked beans reserved to puree and thicken the juices. Traditional side dishes might include collard greens, garlic rice, thinly sliced oranges, and perhaps some tiny hot peppers. This isn't that; it's a soup more "in the spirit of" a traditional feijoada. 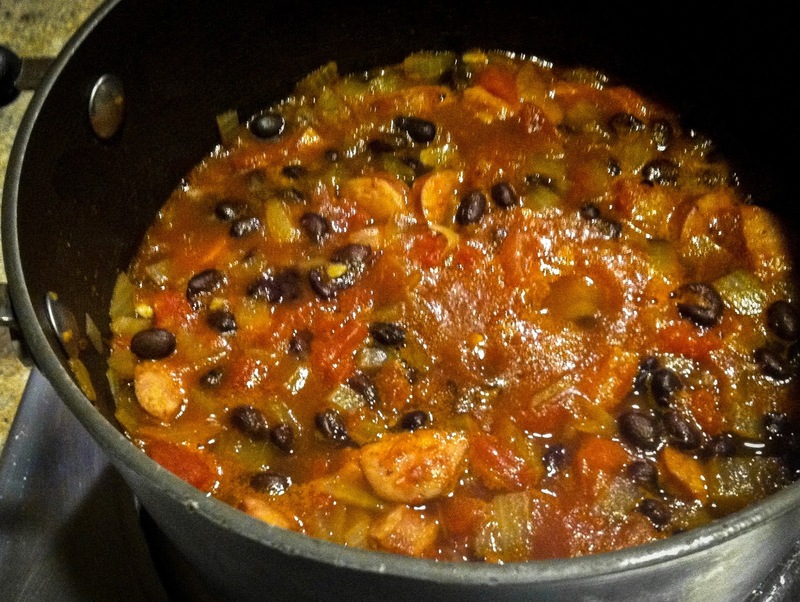 Reminiscent of Cajun red beans and rice, yet totally different, we loved this soup on day one. On day two the beans had soaked up much of the broth, turning my feijoada into more of a stew, still flavor packed and satisfying. This substantial bean and pork soup/stew now ranks high on the list of our favorite winter comfort food recipes. What's your favorite meaty bean soup? Drain and rinse the black beans, repeat, drain again and set aside. Cook the bacon pieces (or just heat the olive oil) in a large, wide-bottomed pot over medium-high heat to render the fat. Add the onion & garlic; cook until wilted, about 5 minutes. Add the diced sausage; cook until browned slightly and some fat is released. Add the tomatoes, cumin, red pepper flakes, drained beans and half of the heated broth. Bring to a boil, then lower heat and simmer until heated through, adding remaining broth as necessary. Serve in individual bowls over a mound of rice and top with the chopped orange chunks, orange zest, parsley and jalapenos (if using). Or cool the soup and refrigerate, letting the flavors develop and meld, then reheat to serve. 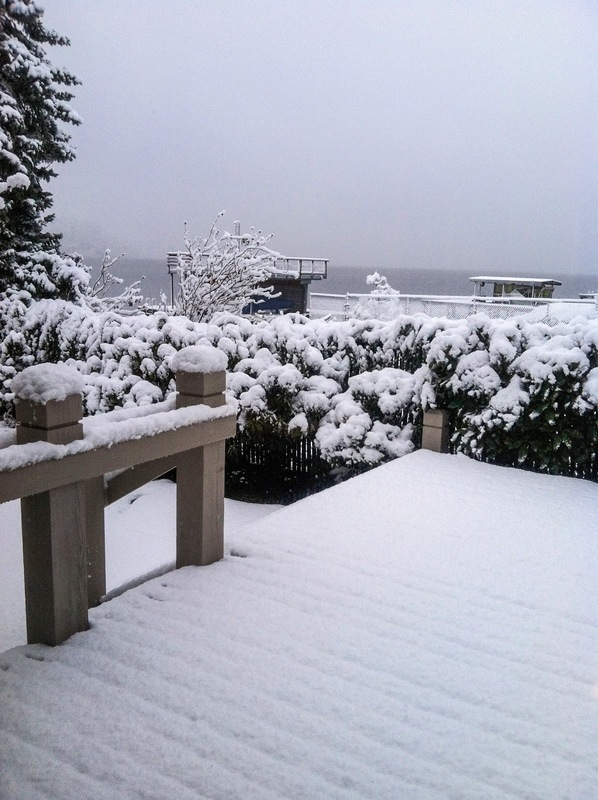 2017 arrived with a mixed bag of weather; welcome days of glorious sunshine, several heavy rainstorms with strong winds, occasional days of dense fog... and then a dump of wet, heavy snow. I love the local fairyland appearance after a fresh snowfall, but not so much the associated challenge of negotiating Seattle's hilly terrain. So my old Mustang convertible never left the garage and I didn't break out the crosscountry skiis to ski around the neighborhood. I DID reorganize some cabinets and continue to weed through the bookshelves in between bouts of drinking therapeutic hot toddies and gazing at the world outside. how is it that frequently used items always migrate to the front of any storage space while the odd bits and pieces eventually disappear from sight. 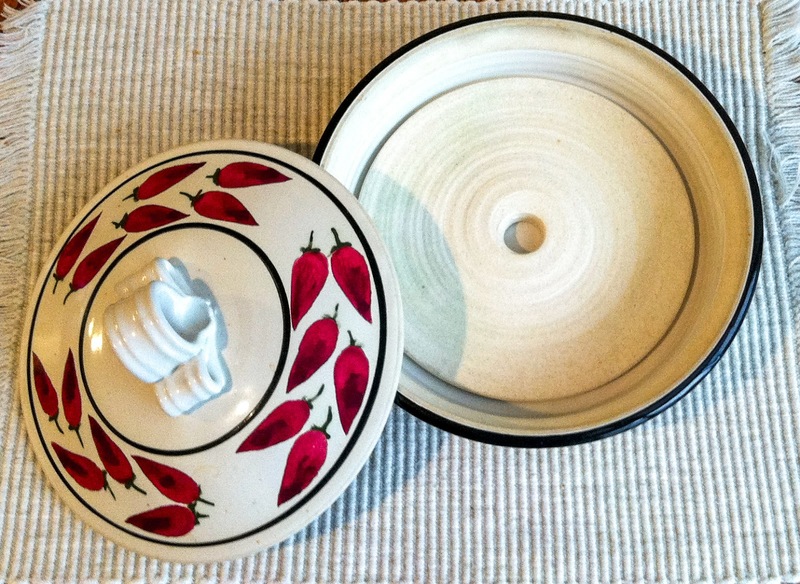 That was the case with a long-forgotten antique pickle server. 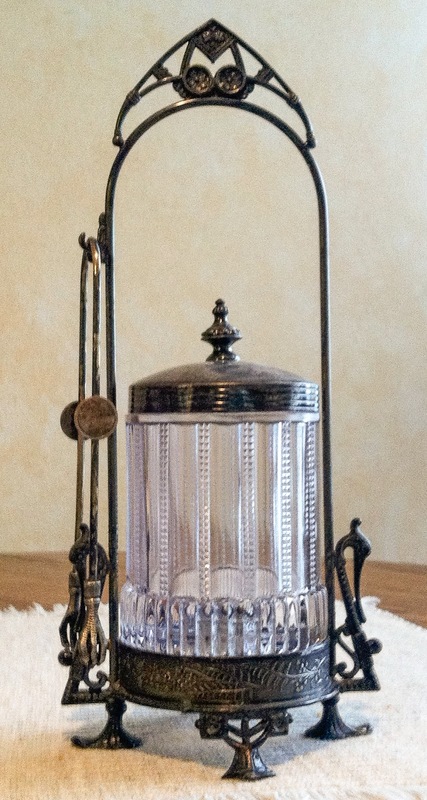 The quantity of tarnish indicates it has been a long time since this piece appeared at a dinner party. Now comes the decision whether to discard or repurpose... I'm still considering. Purchased on a whim for a kitchen sushi class with Hilary (link), this plastic hand roll (temaki) stand needs a new home. 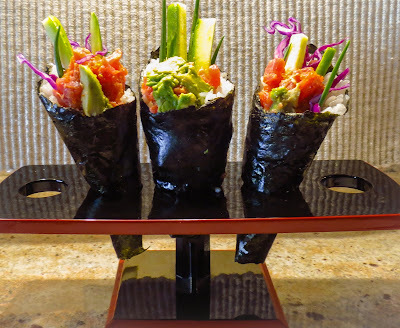 The two of us had great fun playing with different sushi devices and presentations, but this item hasn't been used again. It landed in the donation box, along with several other "treasures". 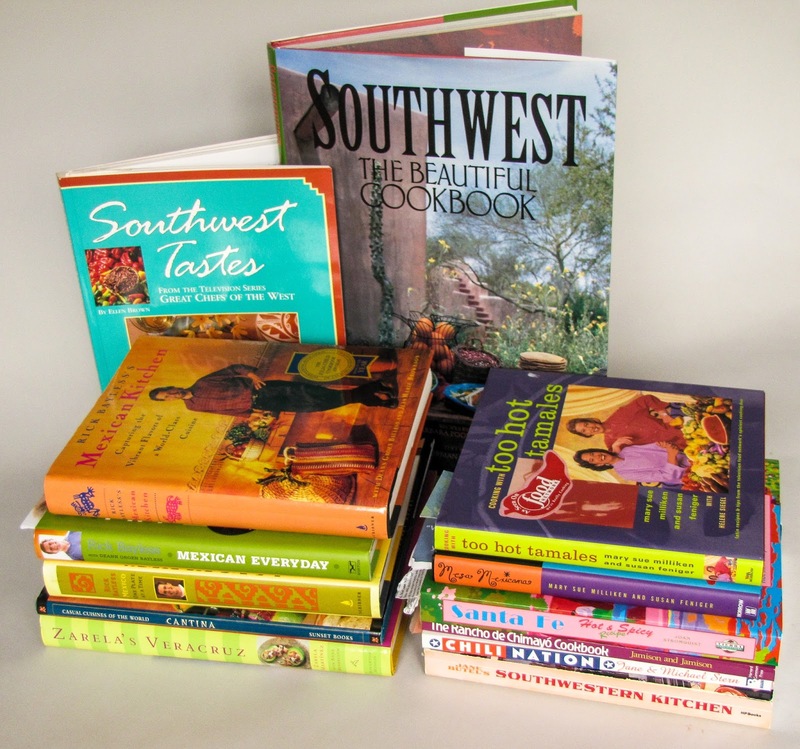 RL swears the kitchen tilts southward due to the weight of my cookbook collection. He's teasing, but I have run out of convenient storage space. 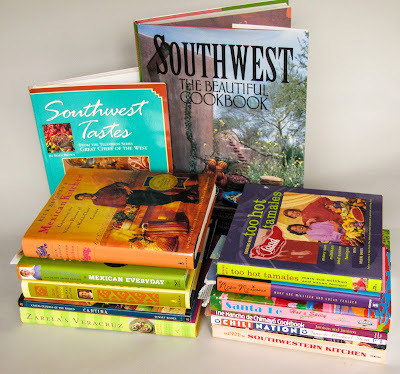 Years ago a Food Blogger Cookbook Swap (link) sent me wandering through the stacks of books then filling up cabinets and shelves, rediscovering scads of forgotten treasures along the way. The challenge continues; I'll never cook my way through the existing collection, yet it is hard to resist the lure of a new cookbook. Solution: we delivered three large cartons of books, cookbooks and some other non-fiction, to the local library, a donation for their annual booksale fundraiser. I'm still working to reorganize the remaining 200+ books by topic, cuisine and/or chef and continue to find new recipes to try. We enjoy food with a flavor bite, so Southwest, Tex-Mex, Mexican dishes frequently top the favorites list. 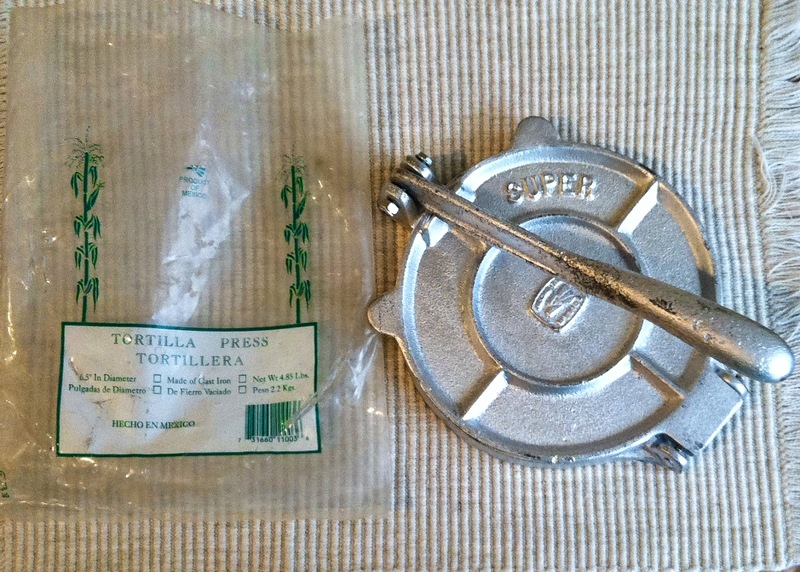 Storebought tortillas are plentiful locally in various sizes, weights and ingredients. Availability and laziness on my part meant the tortilla press, comal and tortilla warmer had migrated to out-of-sight storage locations. It's decision time again - put them to use in the next month or two, or send them off to a new home. Omigosh, sudden memory flashback to a wonderful weekend of cooking classes with Jane Butel in New Mexico eons ago with BFF Betsy. Yes, I've done some actual cooking lately. Big pots of hearty soups and stews kept us fueled during winter-weather lunches, comfort food for body and soul. 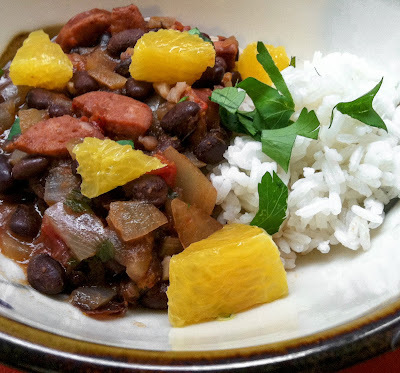 A new-to-me recipe for feijoada was the latest winner, but how could it miss with smokey Basque chorizo and black beans in a fragrant and flavorful sauce? Recipe to follow soon. Alaska dreaming and cruise planning fills many hours every winter, with RL handling boat prep items and me considering itinerary and dining issues. Inevitably we drift to reminiscing and skimming our ginormous collection of images from nearly 17 years of Alaska cruising. Recently a 3-pound package of frozen, store-bought blueberries recalled memories of floating up against a steep bank at high tide to harvest some fat, ripe huckleberries. (link) RL held onto some overhanging branches to keep the skiff in place while I picked berries... until we heard crashing foliage and noticed movement on the far side of the berry patch. Grizzly bear? Mmmmm, maybe. 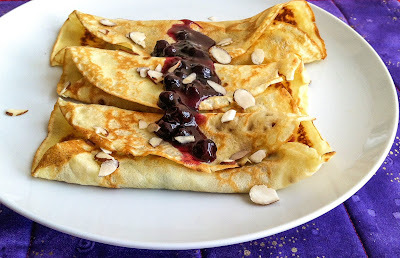 At home this month commercial blueberries made scrumptious blueberry syrup and filling for Swedish pancakes, but I'm looking forward to picking wild berries once again in SE Alaska... with a scout and without animal company. OK, maybe a worm or two. What's happening in your kitchen lately? Multi-talented Liz (writer, cook & traveller) hosts a monthly gathering of cooks from around the world who share thoughts and views into their kitchens. Click over to her blog, Bizzy Lizzy's Good Things, and enjoy... or join in the IMK fun.